Winner of the Christopher Medal. A beautiful and moving picture book about the bond between a grandparent and child and the enduring spirit of love. An inspired collaboration between the award-winning author of Old Turtle and acclaimed illustrator P. J. Lynch, a two-time winner of the Kate Greenaway Medal. Grandad is the boy’s best friend. Being with him always makes the world seem right. And how vast that world is. A world of tall trees that reach for clouds and sun and moon and stars (and what else is reaching for heaven but a prayer?) Rocks that stand still and silent (two important ways to pray). Streams lying calm, reflecting clouds. And then, of course, there are the people, who pray in many ways, for many reasons. Each time he and Grandad walk in the woods, the boy listens for the prayers of the earth. And while he isn’t always sure he hears them, Grandad’s words inspire him to keep listening. Doug has written a wise and moving story for readers of all ages. With paintings by acclaimed artist P.J. Lynch, this beautiful and uplifting picture book is a true publishing event. 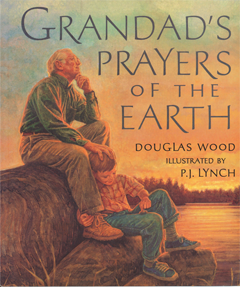 Like a prayer, Grandad’s Prayers of the Earth may just change your life forever.